The Spanish Civil War finished 80 years ago yet from time to time unexploded ordnance turns up, as was the case in Lújar last Sunday. On the 3rd of February hunters in the Barranco las Negras area on the Sierra de Lújar came across what appeared to be a hand grenade. They immediately informed the Guardia Civil in Órgiva (the location is within its municipality). 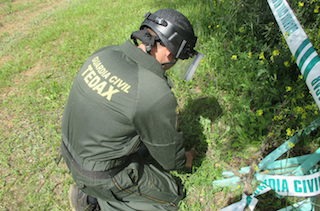 The Guardia Civil bomb-disposal team (TEDAX) confirmed that it was a Civil-War era, hand grenade of the mills bomb kind; i.e., a fragmentation device. Its fuse was intact. It appears that recent rainfall had exposed the artefact. They moved it to a safe, nearby location in order to detonate it, which they carried out with no further incident. The bomb-disposal team have already been called out three times this year; twice in Granada and once in Jaén to deal with munitions from this 1930s conflict. If you do happen to come across what looks to be a bomb, shell or grenade then you should phone 062 (Guardia Civil) or 112 (general emergencies). No attempt should be made to pick it up, play football with it, or prod it with a stick. Refrain from taking it home as exploding ornaments tend to complicate housecleaning. This entry was posted on Thursday, February 7th, 2019 at 8:49 am	and is filed under Alpujarra. You can follow any responses to this entry through the RSS 2.0 feed.